Aaron Boone dreams of the Nightbreed running loose outside a set of cemetery gates. Boone wakes in bed with his girlfriend Lori Winston, who suggests that the two of them get out of Calgary for a few days. Boone tells Lori that his therapist, Dr. Philip K. Decker, has been calling again. Lori suggests returning to Decker to see if the doctor can help with Boone’s strange dreams. Meanwhile, a serial killer wearing a mask with button eyes and a zippered mouth murders a family in their home. Boone visits Decker’s office where the two men discuss Boone’s dreams about monsters and a place called Midian where sins can be forgiven. Decker shows Boone crime scene photographs given to him by the police, claiming that they asked if one of Decker’s patients could be the killer. Decker convinces Boone that his dreams match details of the murders and that Boone unknowingly killed six families in ten months. Decker gives Boone lithium and offers him 24 hours to turn himself in. Boone pops one of the pills. At home, Lori wonders where Boone is. In a daze, Boone wanders into the street and is hit by a truck. At the hospital, the doctor reveals that the pills Boone took were actually hallucinogens. As he recovers in his hospital bed, Boone hears a man named Narcisse muttering about Midian as a place where monsters go to be accepted if they are worthy. Narcisse tells Boone where Midian is located. Believing that the Nightbreed have sent Boone to test his worthiness, Narcisse decides to show Boone his true face. Using a pair of ringed thumb blades, Narcisse cuts around his face and pulls the rest of the flesh off his head. Decker arrives with Detective Joyce and the police. Boone flees. Joyce allows Decker to interrogate Narcisse privately. Lori is called to identify Boone’s body and she has a brief discussion with Decker. While the coroner takes a break from performing the autopsy, Peloquin’s bite wound resurrects Boone and he escapes. In frustration, Decker reviews the session tapes where Boone discusses Midian. Lori stops at a bar as she searches for Midian. While crying in the bathroom, Lori wins the sympathy of barfly Sheryl Ann and the two women become fast friends. Although hung over, Sheryl Ann prepares to accompany Lori on a road trip to Midian. Sheryl Ann mentions having hooked up with a banker named Curtis the night before. Sheryl Ann listens to music in the car while Lori explores the cemetery. Curtis pulls up outside to greet Sheryl Ann and turns out to be Decker using an alias. Lori finds a small creature dying in the sunlight. Nightbreed Rachel pleads with Lori to rescue the creature. Once out of the sun, the creature turns into Rachel’s daughter Babette. Lori pleads with Rachel and Lylesberg to take her below to see Boone, but they refuse. Lori tries entering their lair anyway, but Peloquin frightens her away. Lori returns to the car and finds Sheryl Ann’s dead body. Wearing his mask, Decker confronts Lori. She runs back into the cemetery for safety. Restrained by two of the Nightbreed, Boone argues with Lylesberg about helping Lori. Boone breaks free and rescues her anyway. Narcisse readies to attack Decker for being accosted in the hospital, but Decker escapes. Lylesberg admonishes Boone for bringing Lori into their lair and for letting Decker escape. Lylesberg banishes Boone and Lori to walk amongst the naturals. Lori wakes below the cemetery. Rachel tells her about the various Nightbreed abilities and weaknesses. Babette touches Lori’s hand and shows her terrifying visions of the Nightbreed being persecuted throughout history. Rachel tells Lori that Boone is now one of them. Lori learns that Boone is in the chamber of Baphomet, the baptizer who made Midian and called the Nightbreed there to save them from their enemies. Lori encounters many more Nightbreed while searching for Boone. Narcisse warns Lori about how Boone has changed. Lori wanders into a chamber where the Nightbreed imprison Berserkers, who are uncontrollable monsters. Nightbreed Ohnaka rescues Lori from their clutches and takes her to Boone in Baphomet’s chamber. Reunited, Boone tells Lori not to look directly at Baphomet. Lori convinces Boone to leave Midian with her. Boone is placed in a cell next to a drunken priest named Ashberry. Captain Eigerman and his men beat Boone for being a cannibal. Decker and Joyce convince Eigerman to look for others like Boone in the cemetery. A doctor examines Boone and finds that he has no pulse. Eigerman angrily asks Decker what they are dealing with. Ashberry warns Boone that he is an abomination who needs to die. Joyce searches the cemetery with Eigerman’s men. They pull Ohnaka into the sunlight and watch him decay into dust before exploding. Narcisse blows up the police vehicle outside the cemetery, prompting Eigerman to stage a full raid on cemetery. Eigerman brings Ashberry with them as a messenger from God. Narcisse and Rachel rescue Boone from the police station. Lori tells Boone that she is not afraid of him as they kiss while he is in monster form. The cemetery siege begins. Decker murders Detective Joyce outside the gates. Boone returns to Midian and convinces the Nightbreed to escape and to fight. Ashberry realizes that the police are killing women and children as explosions begin tearing Midian apart. Ashberry pleads with Eigerman to stop. Boone saves Ashberry before Eigerman can shoot the priest. The battle between police and Nightbreed rages everywhere. Boone convinces Lylesberg to release the Berserkers. Ashberry finds Baphomet’s chamber and is burned by a scalding liquid. Lylesberg is shot in the head before he can release the Berserkers, but Boone sets them free. The Berserkers begin killing the raiders, prompting Eigerman and the others to flee. Peloquin shows Lori a painted mural that prophesized Boone’s arrival as a savior, but Peloquin laments that Boone turned out to be a destroyer. A fight between Decker and Boone results in Boone impaled on a long blade. With the blade protruding from his torso, Boone pulls Decker onto it and kills the doctor. Lori pulls the weapon out of Boone. Boone goes to Baphomet’s chamber. Baphomet tells Boone that he destroyed Midian, but it was inevitable. Baphomet commands Boone to rebuild a home for the Nightbreed and to find, heal, and save Baphomet from his enemies. Baphomet renames Boone as Cabal. Midian collapses completely. Hiding together in a barn, the surviving Nightbreed watch as Boone says goodbye to Narcisse and sets off with Lori. In the ruins of Midian, Ashberry blames Baphomet for his disfigurement. Ashberry covers his hand in the strange liquid from before and puts it inside the chest of Decker’s corpse. Decker returns to life. Click here for the review of Nightbreed: The Cabal Cut. In the years since the 1990 release of “Clive Barker’s Nightbreed,” much has been made in various horror-related circles about the film’s post-production woes and its studio-mandated editorial revisions. Artistic intent clashed with perceived marketing needs and the resulting compromise produced a film that no one was completely happy with. That includes the director and the studio, as well as the audience. 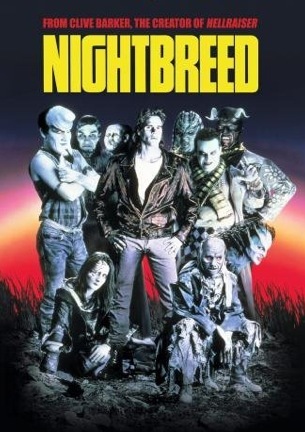 Going into a contemporary viewing of the theatrical cut with this hindsight of how behind-the-scenes tumult morphed the end product does not justify the issues that “Nightbreed” has, but it does explain why the film suffers from an obvious identity crisis. Boone is a leather jacket-clad bad boy who is head over heels in love with regular girl Lori. Theirs is the kind of lifestyle that subsists on their undying affection for one another. If only Boone could stop dreaming about murder, monsters, and the mysterious gates of a place called Midian, he might be able to devote himself fully to their relationship. Treating the fractures in Boone’s psyche is Dr. Decker, a man who moonlights as a mass murderer in a dirty mask with button eyes and a zippered mouth. Decker successfully convinces Boone that he is actually the city’s most wanted serial killer and pins the crimes on his troubled patient. The resulting manhunt forces Boone into hiding below a cemetery, where he discovers a cadre of monsters, mutants, and misfits living in secret. On capsule synopsis alone, “Nightbreed” baits a fantastic hook. Masked killers, numerous creatures, and a climactic firefight that would leave John Rambo’s jaw on the floor. What could go wrong? The answer is in the movie’s living proof that a jack-of-all-trades is usually a master of none. Thematically, “Nightbreed” tries covering an astonishing amount of ground for what was originally the novella length story “Cabal.” “Nightbreed” weaves together threads that include intolerance, desire, transformation, and misguided morality around a romance, a serial killer police procedural, and an old-fashioned monster rally. So many elements combine for such a complex tale that “Nightbreed” is already in the hole by condensing everything into just over an hour and a half. “Nightbreed” has too many ideas and too little time. The love story between Boone and Lori is crucial to what Barker wants to establish, but with only one brief scene together before Boone breaks for Midian, their star-crossed tale is flattened before having a chance to fully inflate. Lori suffers an extension of this fate by being forced to walk through the film with a glazed over expression of grief or disbelief. The audience is all but robbed completely of any opportunity to see her do something besides frown, keeping her personality as flat as the romance. Character development is the first casualty of the theatrical cut. The portion of the screenplay that makes it onscreen overflows with roles whose purposes are perfunctory, if not entirely unnecessary. Ignorant of Barker’s original plans, the inclusion of two separate shady lawmen appears superfluous. Reverend Ashberry feels like an eleventh hour inclusion. And even without knowing that over an hour of footage was trimmed from the final version, it is plain to see that scissors went wild in the editing room and created Grand Canyon sized gaps in the storyline. When Lori begins her search for Boone, she wins the sympathy of a barfly named Sheryl Ann after the other woman finds Lori sobbing in a bathroom. The two ladies bring new meaning to the phrase “fast friends” when their next scene together is in preparation for an extended road trip to find Midian. Although he had technically met a trio of Nightbreed previously, the first depiction of Boone in Midian’s underground is combined with his initiation into the Nightbreed. He appears to be meeting several of the creatures for the first time, yet he has also already received enough tutoring in their laws by his advocate that it is time for an official rite of passage. Such jumps do not necessarily make the narrative confusing, but they do make it a choppy ride. With imbalanced plot points and disproportioned character arcs working against the film’s efforts to gel into a cohesive whole, it is a marvel that age has been somewhat kind to “Nightbreed.” That is because as flawed as it is, “Nightbreed” is not a completely lost cause. Judged on design alone, the characters are a success. David Cronenberg’s Decker mask and gentleman’s attire is an effectively simple evocation of fear sure to turn heads if worn as a Halloween costume. The Nightbreed themselves are fantastic both in design and in execution. Strangely, that emphasis on their arresting visuals is what fuels the disappointment when most of the monsters are ultimately given little to do besides skulk in subterranean shadows. Tim Burton fans can disagree, but Danny Elfman has never contributed a more fitting film score. The signature Elfman blend of darkness and fantasy by way of his distinctive horns and children’s choir la-la-la’s is perfectly synched to the atmosphere of Midian and the revelry of the Nightbreed. As a feast of sights and sounds, “Nightbreed” is a sumptuous triumph. Unfortunately, the Frankensteined edit truncates the story at its knees and nearly everything else about the project causes it to fall face first in the dirt. Not without redeemable charms, “Nightbreed” is far too bloated by its own ambition to have ever had a chance of succeeding with compromised creativity or with an abbreviated runtime.